“Mohawk” might be a historical movie with a distinctly ahistorical vibe, given its synth score and costume design that doesn’t exactly feel lived in, and yet, writer/director Ted Geoghegan’s indie is a testament to how exploring the brutal truth of Native American genocide might be better assigned to low budget horror than big budget prestige. In watching “Mohawk” my mind kept flashing back to “Hostiles”, the more impressively pedigreed western that in seeking to convey America’s cyclical nature of violence remained too beholden to absolution and the nagging need to ensure its stars made it to the end. Geoghegan, however, freed from studio shackles, can see his horror all the way through, and even if the production limitations are often evident, there is nevertheless urgency in the DIY filmmaking that transcends its limitations and breathes life into its very obvious re-enactments. Set in 1814, “Mohawk” opens with Joshua (Eamon Farren), a British agent, urging members of a Mohawk tribe to forgo neutrality and enter his nation’s war against America. One is hard pressed not to notice the wooden acting, and the occasionally overwritten dialogue is only made more conspicuous by that wooden acting. As such, Geoghegan picks up speed, mostly opting out of long dialogue passages for the thrill of a chase incited by Calvin Two Rivers (Justin Rain) ignoring the wishes of his elders and sneaking off into the night to massacre an American militia camp. Soon after, the surviving America militiamen, led by Hezekiah Holt (Ezra Buzzington), are tracking Calvin Two Rains as well as Oak (Kaniehtiio Horn) who shares a polyamorous relationship with Calvin and Joshua, a detail that is wonderfully not lingered over or exploited, just presented as is, a fact of life. If the most of the perfomances are just sort of virtual zeroes, Buzzington at least has a little verve, suggesting Ben Mendelsohn as his most down and dirty. And while mostly forgoes the aristocratic air that often imbues these sorts of period roles for something more backwoods, as if it’s an Early Republic version of The Holler, he also exhibits an attitude of impressive entitlement that goes hand in hand with his character. Indeed, though Holt intones something about being the devil, he also dismisses the Indians as unworthy of God. And while he mourns the death of his son, he has no qualms about trying to kill Oak even when it’s revealed that she is with a child, which seems a little less than Christian. In the wake of Calvin Two Rains’s reckless act, the Mohawks go into hiding. This might have merely been a device for the production to avoid having to hire extras, though it makes it seem as if the tribe is being erased right before our very eyes even if it simultaneously undercuts the notion of the Americans being in danger from moving through Mohawk land. Despite the latter, Geoghegan still makes these woods feel claustrophobic and ominous, forgoing establishing shots to keep the camera close to its characters, so close that if often elicits the sensation of not knowing who may be lurking nearby. In this way, his horror movie shock cuts gain some credence, even if you can’t help but think these characters might be better trackers and detect people before they slip into the frame unannounced. And even if the cast is deliberately limited, Geoghegan makes the one scene involving a peripheral character count, a nameless French trapper having his canoe taken by Oak and Joshua. Like, if that stock scene in action movies where a cop or criminal commandeers a car never lingers on the beleagured owner of said car, here it does, and the French trapper’s distress at having his whole existence upended is palpable. The conclusion trucks in a supernatural element that never comes off if only because “Mohawk” isn’t willing to go all the way with it, falling back on a conventional action movie climax instead. Not that the movie’s spell is fully broken. 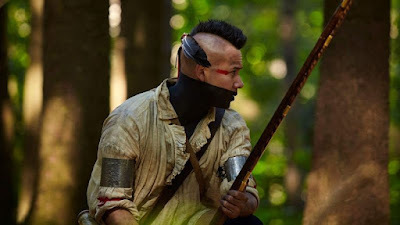 If anything, “Mohawk” itself is sort of supernatural, which might sound like a jejune thing to say, but seriously, even if you never ever feel like the movie is in 1814, like these are mere re-enactors shooting a student film in the woods, an authenticity still percolates. It’s one horror movie where all that splattered blood doesn’t feel gratuitous but a part of the point. “The blood soaks into the ground,” explains Oak at one point. “It seeps into the roots.” Against all odds, it does. You feel it. In one death scene that Geoghegan shoots from ground level, we see a Mohawk, already brutally injured, crawling through the mud, a futile escape from the militia behind him, before Holt orders the Indian shot dead. The elegiac synth laid over this is strictly modern, but rather than working to take you out of the moment, it pulls you in, merging the past with now, as if to say this nation, still trudging ahead and screwing up, is carrying the weight of all those sins.